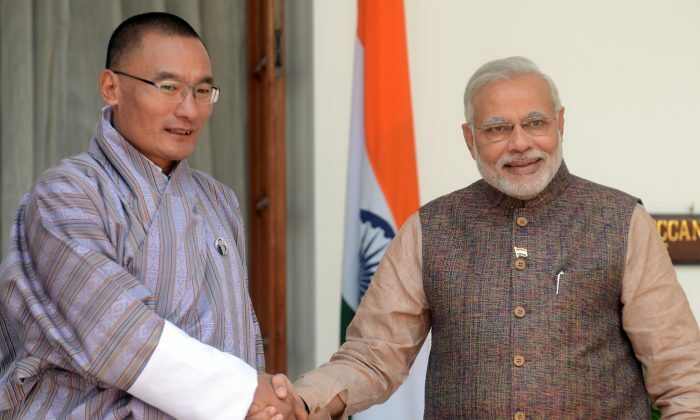 A day after India’s new Prime Minister visited Bhutan, Bhutan’s Prime Minister Tshering Tobgay reaffirmed that they would not allow China to open an embassy in the national capital, Thimpu. India-Bhutan relations have a long history. India’s first Prime Minister, Jawaharlal Nehru, trekked to the Himalayan nation partly by mule-back in 1958. However there were recently concerns in India’s diplomatic circles when Bhutan’s last prime minister, Jigme Thinley, met Chinese Prime Minister Wen Jiabao in 2012 on the sidelines of an international summit. It was the first meeting between the heads of the two nations. There were indications that China was trying to establish stronger diplomatic ties with Bhutan. Although Bhutan remains relatively isolated, it still has diplomatic relationships with many countries—not, however, with the Chinese regime. Bhutan and India are the only two nations with which China has still not been able to resolve border disputes. Bhutan held elections in May and July last year. Experts say the Jigmey government was ousted because of his attempts to ally with China over India. “After that (meeting of Bhutanese and Chinese Prime Ministers) during elections the people of Bhutan chose a government which sought to strengthen the relationship with India further—because there was a perception in Bhutan that the Jigmey government was trying to win Bhutan away from India’s sphere of influence,” said Dr. Ashok K. Behuria, Head of the South Asian Center at the Institute for Defence Studies and Analyses in New Delhi. Bhutan—a Buddhist nation with a population smaller than San Francisco—sits land-locked in the Himalayas between China and India, the world’s two most populous nations. Bhutan has always had tense relations with communist China over issues ranging from an ongoing border dispute to its granting of asylum to Tibetan refugees. Bhutan tilts instead towards India when it comes to diplomacy, security, culture, and economic development. By contrast, India has been helping Bhutan to set up democratic institutions and is also supporting it in various development projects. During his trip to Bhutan, Narednra Modi inaugurated the Bhutanese Supreme Court, which was built with India’s assistance. He also laid the cornerstone of a hydroelectric power project, a joint venture between the two nations. “Our Hydropower cooperation with Bhutan is a classic example of win-win cooperation and a model for the entire region,” Narednra Modi had said in a statement before his visit. The common perception in Bhutan is that China does not believe in win-win situations. Culturally, according to Dr. Behuria, the Bhutanese relate more to the Indian spirit of tolerance and pluralism and feel safer with India than with any other nation in the vicinity. “Over the years the Tibetans have suffered like anything and this is something known to the Bhutanese,” he said. Dr. Behuria says that the Bhutanese know that their most important diplomatic relationship is with India. “And that’s what is propelling the India-Bhutan relationship in the right direction,” he said. The Bhutanese understand that well-being and happiness depend on a healthy environment.